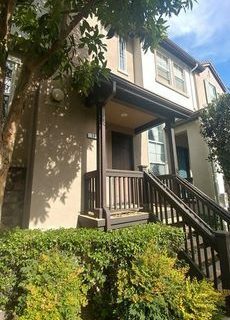 Tucked away on a quiet street with pretty walkways and lovely landscaping this highly desirable townhome features 1,329 square feet of well-designed open living space with an abundance of natural lighting. The large and open kitchen has plenty of storage and counter space complete with an island. Beautiful laminate flooring, Vaulted Ceilings, and a cozy fireplace. Freshly painted with Plantation Shutters. The two car tandem garage has direct access and plenty of room for storage. Upstairs you will find a large office space in addition to two spacious bedrooms; each with their own bathroom. The master bedroom is complete with a walk-in closet. Conveniently located walking distance from the Edwards Aliso Viejo Stadium 20 & IMAX theaters, Stadium Brewing Company, and numerous other restaurants, shops, and grocery. Camden is comprised of 157-homes and sits adjacent to Don Juan Avila Middle & Elementary Schools.